The Stones have captured their record reaching "Bridges to Babylon Live" show onto a rockin' two hour video. Shot in St.Louis, MO, it captures all of the highlights of the concert including a light and video show and all of your favorite songs. Whether one truly believes that the Rolling Stones remain "the world's greatest rock band," at this point they can rightfully lay claim to the title of "the world's most remarkable rock band." Whatever one may think of the group - and any act as successful as they certainly has more than a few detractors - the fact that they have remained one of the most popular bands in the world for four decades straight is awfully amazing. During an era in which most new bands have trouble maintaining success for two or three years, a band that's past its fortieth anniversary and still filling stadiums certainly deserves some recognition. 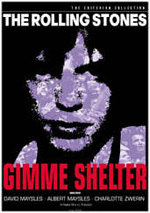 One of the main criticisms frequently leveled at the Stones occurs due to the alleged lack of deviation from their musical "formula"; i.e., the Stones in 1998 didn't really sound all that different from the Stones in 1978 or 1968. To a certain degree, that's true, though not as uniformly as many would insist. The Stones do attempt different styles and genres on their albums, but because their signature sound is so distinctive, these attempts may not be readily recognized. One area in which agree that the Stones tend to be too conservative is their concerts. I've seen the Stones 36 times since 1989, and while the shows are consistently interesting and entertaining, their song selection can't exactly be called "adventurous." Basically, you're talking lots of hits and radio favorites; anyone looking for obscurities will probably be disappointed. 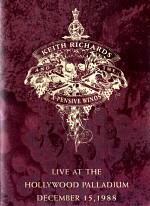 The DVD release of the December 12, 1997, concert from their Bridges to Babylon tour - also broadcast as a pay per view special - highlights this tendency. Of the 19 songs included in this program, 14 are instantly recognizable to the vast majority of the public - fans or not - as "Stones classics." We get tunes like "Satisfaction," "Brown Sugar," and "Start Me Up", which virtually everyone will know. Of the other five, one's a classic, but not associated with the Stones ("Like A Rolling Stone" by that Zimmerman guy), three are from the then-current Bridges to Babylon album, and one ("I Wanna Hold You") is an obscure Keith track from Undercover. Like I said, not a whole lot of surprises here; basically they’re all songs that the casual fan - the kind of person in the majority amongst the tens of thousands at the stadiums - instantly knows. While the song selection is fairly tired, the performance is not, though it also lacks surprises. At this point in their career, I don't think the Stones are truly capable of any real surprises. That's not meant as a criticism; it's meant as a recognition that the Stones are truly a professional, well- oiled machine at this point. This means that while it's unlikely that you'll experience a poor performance by the band, it's also unlikely that you'll witness a transcendent show. Take that as good or bad, but that's where the Stones are as they near the end of their fourth decade together. The Bridges to Babylon Live DVD lives up to this statement. It's a solid show, and it lacks any significant flaws. It represents the Stones as they currently are: a tremendously solid live act but not one that will likely blow your socks off. 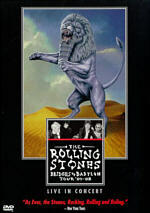 Rolling Stones: Bridges to Babylon Tour ’97-‘98 appears in an aspect ratio of approximately 1.33:1 on this single-sided, double-layered DVD; as such, the image has not been enhanced for 16X9 televisions. Though not excellent, the picture generally looked solid. Sharpness mostly appeared crisp and distinct. Concert videos inevitably encounter a few out of focus shots, and I saw one or two of those, but they were quickly corrected, and the vast majority of the program showed no signs of those concerns. Almost all of the show displayed detailed and well-defined images. On occasion, slight jagged edges gave some aspects of the show a mildly ropy look, but those instances were very infrequent. I discerned no signs of moiré effects or edge enhancement. The videotaped program demonstrated no issues related to artifacts or other interference; it seemed clean and fresh. As usually occurs with concerts, most of the colors came from the lighting. These hues appeared consistently clean and accurate, as I detected no bleeding or noise attached to them. Colors came across as warm and natural, and the lighting never obscured the performers unnecessarily. Black levels seemed nicely deep and rich, while shadow detail was appropriately heavy but never excessively opaque. All in all, I found Babylon to offer a very good visual experience. Though not great, the Dolby Digital 5.1 of Babylon mostly worked well. The soundfield maintained a forward emphasis that usually seemed appropriate. Instruments and vocals showed good differentiation and delineation, and they blended together appropriately. The surrounds offered crowd noise as well as some background vocals and percussion. These didn’t become intrusive, but I felt they seemed a little gimmicky at times. The mix also amped up the crowd noise to unnatural levels; clearly someone added some cheering in post-production. I constantly heard audience noise even when none seemed appropriate; this left the impression that the crowd never quieted down. Nonetheless, the soundfield worked reasonably well for the material. For the most part, audio quality appeared fine. Vocals generally sounded warm and natural, and I noticed no edginess or other concerns in that regard. Instruments mostly came across as distinct and accurate, and the track generally displayed good dynamic range and fidelity. Bass wasn’t as prominent as I’d like, though. Low-end response seemed moderately lacking during much of the show; bass was there, but midrange dominated the piece and made it sound a little thicker than I’d expect. Again, the track mixed the crowd too high for my liking, but for the most part, it represented the music fairly well. Babylon includes no supplements. "Reel Recommendations" shows simple ads for the DVDs of Woodstock and Purple Rain, but without any actual trailers, I can’t consider this to present a real extra. I was bothered by the omission of extra songs. As it stands, this DVD - along with the laserdisc and VHS releases - omit four songs from the original concert: "Corinna, Corinna", "Anybody Seen My Baby", "The Last Time," and "All About You." I understand leaving this off the VHS version to save some tape, but why not reinstate them here? Clearly some care was taken with this package; otherwise why would it be the only version with a 5.1 soundtrack? Four songs may not sound like much, but it amounts to more than 17 percent of the show, and there was no reason they should have been omitted. That said, the Bridges to Babylon DVD is actually quite a step up from the more heavily edited Stones concerts presented on home video in the past. 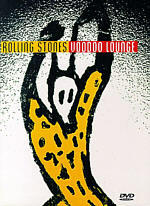 The only way to get a full concert video from their 1994-95 Voodoo Lounge tour was either to tape the November 1994, pay per view or to buy the laserdisc import from Japan (which typically costs a bit more than $100); the regular Voodoo Lounge Live program edits the approximately 135 minute show down to 90 minutes. In regard to the Stones' 1989 and 1981 tours, the options are even more limited: it's either copies of their respective pay per views or highly edited films (The Stones Live at the Max and Let's Spend the Night Together, both of which are also whittled down to about 90 minutes). At least Bridges to Babylon is something of a step in the right direction. Despite the omission, Bridges to Babylon offers a quality product. It displays a very good Stones performance in good fashion. Both picture and sound seem quite solid. The package lacks extras, but it stands as a nice representation of the band’s work and earns my recommendation.